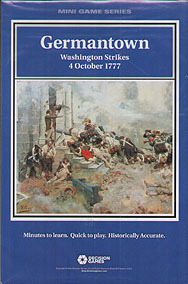 A British campaign in the late summer of 1777 had defeated George Washington's American army and captured Philadelphia. The British dispersed their strength to hold the city, reduce Colonial forts along the Delaware River, and watch the Americans, who hovered nearby. Washington saw an opportunity to attack the weakened British main body at Germantown. The multi-prong American plan fell apart in dense fog, but a few breaks going their way would have endangered the British position in eastern Pennsylvania. Germantown uses the simplified QuickPlay version of the Musket & Sabre system of warfare during the muzzle-loading era. Combat is based on unit quality rather than raw numbers, and rewards use of historical tactics. All units are susceptible to rout when weakened, so players must maintain reserves. Leaders enhance unit capabilities. Special rules cover the characteristics of eighteenth century warfare, especially the emergence of light infantry, and the differences between regulars and militia. Winning the battle depends on deployment, thoughtful manoeuvre to concentrate at the key points, the proper coordination of arms, careful use of leaders and special units, and an understanding of the strengths and weaknesses of each army.